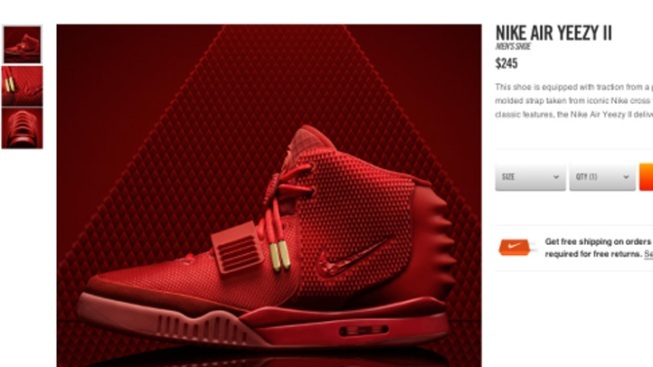 Kanye's Red October Air Yeezy II sneakers sold out in 10 minutes. Chicago rapper Kanye West is proving to be as adept at selling shoes as he is selling music. Nike quietly dropped West's Red October Air Yeezy II sneakers on Sunday, creating a furor amongst sneaker heads and selling out immediately on Nike's web site. Bids on eBay for the shoes were as high as $5,600 as of this writing. Nike initially listed the all-red kicks for $245. It may be West's last collaboration with Nike after signing a $10 million deal with Adidas.